The count down is on and I'm going to help you bring the best sugar cookie recipe to the table! The cookie table that is. Did you know, the traditional "cookie table" originated in the northeast Ohio/southwest Pennsylvania region, a.k.a Pittsburgh and Youngstown! This must be why I eat a million cookies during the holidays. We always celebrate Christmas Eve with lots' of food, drinks, and dessert - truly nothing is off limits! It's one of my favorite nights of the year; nothing makes me happier than spending time with family, friends, and some of our favorite foods. Like I said, nothing is off limits for us during the holidays, I love indulging in sweets and things that I wouldn't normally eat on a regular basis. My grandma was the greatest holiday cookie baker and would make around six different types of cookies, every holiday season. I say 'season' because she would literally start making her dough after thanksgiving and would bake until Christmas! I remember the days that I would sneak into her fridge and steal a cookie long before our big holiday dinner. And maybe that's why she always made so many, she just always knew. My grandma always made the best sugar cookies. I'm pretty sure her recipe consisted of butter, sugar, and eggs, which would explain why they were so good. I can remember how light and buttery they were without being overly sweet or crunchy. They were like little ivory pillows, topped with green and red sugar sprinkles and baked to absolute perfection. Never crumbly or dry; rather soft, condensed and chewy. They were everything that you would want from an after dinner holiday treat. The key is ensuring that you don't over-bake your cookies. Everyone loves a cookie with a spongy, cake batter like consistency and that comes from baking it at just the right temperature and for the perfect amount of time. This attention to detail is even more important when it comes to baking with 'healthier' or natural ingredients. Many classic cookies recipes were developed using refined white sugar, butter or vegetable oil, and over-proccesed white flours - ingredients that we wouldn't classify as being healthy today. Our world has changed quite a bit since the Julia Child Era and the rise of the Betty Crocker franchise; we are learning about the importance of nutritious ingredients and how we can in fact use them in traditional recipes. We can substitute flour that has been stripped of any and all nutrients for a flour that has macro and micronutrients. We can replace cane sugar and high fructose corn syrup with lower glycemic, natural sugars such as coconut sugar or maple syrup. We can choose grass-fed butter over traditional pasture raised butter to ensure that we aren't consuming harmful hormones and chemicals. The list goes on and on - healthified baking is easier than you think and truly will make the biggest difference in how you feel. These all natural sugar cookies have zero grams of refined sugar and even have some good for ya nutrients. 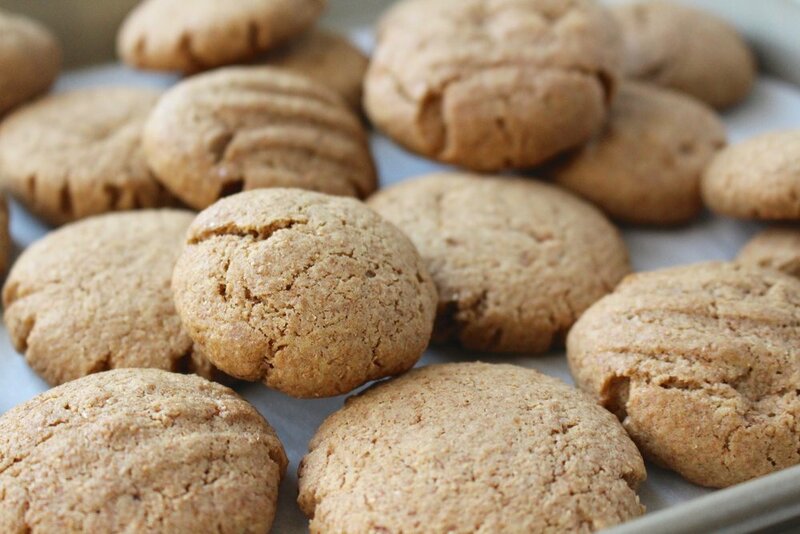 Of course these are still cookies so I wouldn't necessarily suggest swapping them with your salad or green shake, but they are a much healthier version than the classics. I do use organic whole wheat flour but if you would prefer to use white flour or a gluten free flour, feel free! If you are using whole wheat flour, be sure that it says "100% whole wheat" - many whole wheat flours are only partially whole wheat or not even whole at all! Tricky tricky labels. 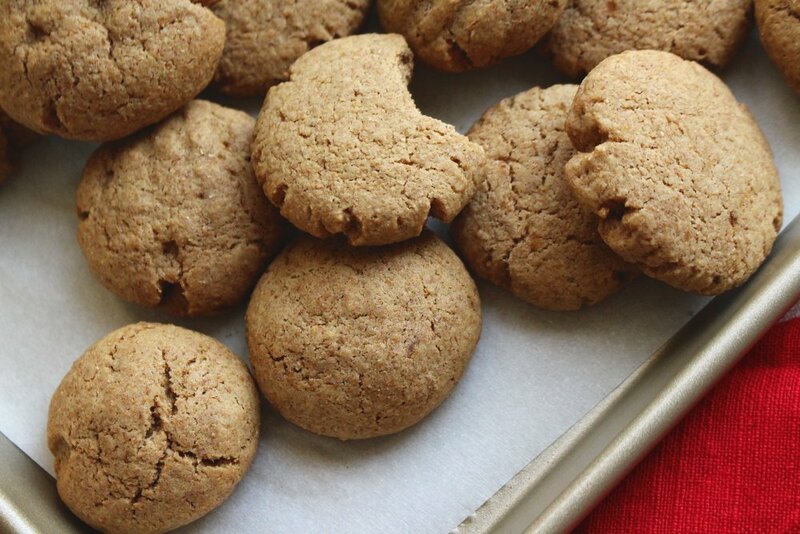 This cookies recipe is a great base for classic round sugar cookies, cut out cookies, or even chocolate chips cookies and peanut butter cookies. You all know how much I love staples and basic recipes, so it doesn't get much easier and versatile than this! I hope you love them as much as we do! In a large mixing bowl, cream together the coconut sugar, maple syrup, coconut oil, egg, vanilla and almond extract until smooth. In a separate mixing bowl, combine the soften whole wheat flour, baking soda, and cream of tartar. Carefully pour your dry ingredients into the wet and begin to stir. The dough will seem too dry at first, but work it together with your hands and a traditional looking cookie dough will form. Place the cookie dough in the fridge for at least 30 minutes to set. Once hardened, roll dough into one-inch balls, place on baking sheet and bake for 8-10 minutes. I personally like a very soft cookie so I took them out at the 8 minute mark and they were perfect!